Many times you need to know the dimensions and size of photos used on giant Social Networking site Facebook for maximum branding exposure and marketing through images in a pro way. Suppose, if you know the dimension and size of Facebook Business Page Cover Photo then you can optimize and design in much better way then just uploading a random photo. So, today we going to share an ultimate cheat sheet explaining you everything about the size and dimensions of photos used on the biggest social network site – Facebook. We’ll cover everything like, What is the size of your timeline cover photo? What is the recommend size and dimension of your Facebook Business Page? What is the size of link thumbnail? And main thing how the dimensions of these photos differ when opening them in Timeline, desktop, mobile, sidebar and news feed? Don’t worry we’ll cover all these questions, bonus tips to optimize your business page and much more. So without wasting more time, let me reveal you the Facebook Ultimate Cheat sheet for following Images first. Facebook Cover photo is the large photo at the top of your timeline, just after your profile picture. The cover photo size should be 851 pixel wide and 315 pixel tall while the size of profile picture must be at least 180 x 180px it is compressed to 160 x 160px later. And the profile picture displays 23 pixels from left and 210 pixels from the top cover photo. For more information see the below screenshot. Facebook Fan page cover photo is the top large photo just above your page profile picture. The same photo dimensions apply here in Facebook fan pages too. The cover photo size is 851 pixel wide and 315 pixel tall and the profile picture of your Facebook fan must be at least 180 x 180px and displays as 160 x160. If you upload the smaller fan page cover photo, it will be stretched to this larger size to fit the Facebook dimension. 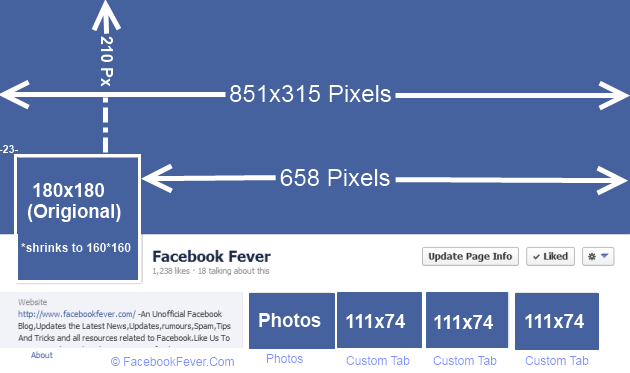 The minimum size of Fan Page cover photo is 399 px wide and 150 pixels tall. Golden Tip : You can be creative with How your fan page profile picture and cover photo display together. On your Business page, the profile picture is located 16 pixels from left side of your cover photo and 176 pixels from the top of your cover photo. There are many rules for Facebook Fan page Cover photo, we’ll cover them in another post. Bonus Tip: If your cover photo consists your logo and text-based content, use PNG file for higher quality. 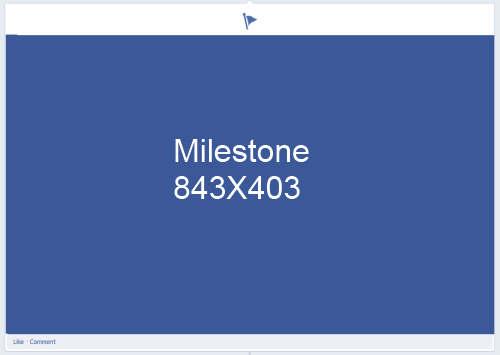 When you share any photo either from your Facebook business page or profile, its dimensions will be 403 pixels wide and 403 pixels tall on the timeline. This photo dimension will shown in the user news feed until and unless you didn’t make the photo highlighted or starred. The dimension and size of the video you shares on your personal timeline or on your Facebook Business Page is 504 pixels wide and 283 pixels tall. Custom tabs are the tabs just below the ‘Like’ button on your fan page. You can add link to your Photo app, Video App, Notes App or link of any other app on these tabs. So, the dimensions of these tabs photo is 111 x 74 pixels. So, if you are adding link of your any app, widget, the thumbnail of that tab should be of the above mentioned size (See picture second from top in the post). When you share any link on your timeline, Facebook fetches the photo uploaded to the Blog post or in the link page (known as thumbnail). The thumbnail is shown at the top of the shared link story. The size and dimension of the link thumbnail is 484 x 252 pixels. If you’ve a optimized call to action thumbnail, it can boost your CTR (Click Through Rate) on that particular link. Milestones are the key moments that you’ve decided to show/highlight on your Fan page or profile. Milestone takes the entire width of the page. Milestone photo displays at the dimension of 843pixels wide and 403pixels tall on your fan page. You can add milestone to show your company/business different important achievements, events, memories etc and share with your audience. A photo shared/published photo on your Facebook Fan page or profile becomes highlighted photo when you click on the button. The starred photo will be highlighted in your timeline with a star banner. So, when you design any photo for publishing on your Fan page or profile page to show this particular photo starred or highlighted then optimize it by the dimension 843 x 403 pixels. So, that it will be shown in a proper way. 1000+ Facebook Symbols You Use In Status, Comments and Messages. So,these are the dimensions and sizes of the photos used by Facebook. Hope this will help you next time when you creating banner etc. for your Fan Page. If you liked the read, do share it with your friends. And if you have any type of Facebook query, drop it in the comment section or mail us, our team will get back to you asap. Thanks for reading, Happy Facebooking! Quickly Upload Photos To Facebook By Pasting The Image URL How To: Get Rid Of Annoying Facebook Photo Tagging How To Create Facebook Shared Album?